A few interesting things have happened since the July Update last week. On the ocean side, weekly sea surface temperatures in the NINO3.4 region have dropped (just) below the threshold of El Niño conditions (using the standard NOAA base years of 1971-2000 for their Reynolds OI.v2 data). On the atmospheric side, the 30-day running average of the BOM Southern Oscillation Index (SOI) has finally neared the threshold of El Niño conditions. But the SOI does not reflect what’s going on along the equator. 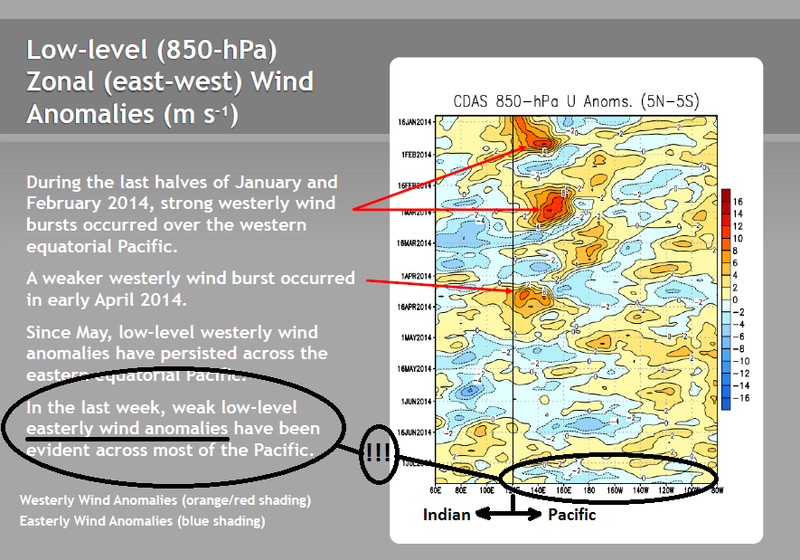 And there is evidence that the trade winds are slightly stronger than normal across most of the equatorial Pacific. Sea surface temperature anomalies for the NINO3.4 region of the equatorial Pacific (5S-5N, 170W-120W) are a commonly used index for the strength, timing and duration of El Niño and La Niña events. (See the map here from the BOM for the location of the NINO3.4 region.) They indicate the surface temperature response of the equatorial Pacific (a part of the ocean processes) to variations in El Niño-Southern Oscillation. NOAA considers there to be El Niño conditions (not a full-blown official El Niño, though) in the equatorial Pacific when the sea surface temperature anomalies for the NINO3.4 region reach and exceed a threshold of +0.5 deg C. El Niño conditions had (past tense) existed in the equatorial Pacific for the past 9 weeks. Those elevated sea surface temperatures were a response to the strong downwelling Kelvin wave that had carried warm subsurface waters from the western to the eastern equatorial Pacific. (For more information about the Kelvin wave see Part 1 of this series.) But that warm water has been rising to the surface over the past few months, releasing heat to the atmosphere primarily through evaporation, and the supply of warm water has dwindled drastically. So drastically, the sea surface temperature anomalies of the NINO3.4 region have recently dropped (slightly) below the threshold of an El Niño. See Figure 1. For the week centered on July 9th, the Reynolds OI.v2 sea surface temperature anomalies for the NINO3.4 region are at 0.43 deg C.
The NINO1+2 region (10S-0, 90W-80W) is in the eastern equatorial Pacific, south of the equator, just south and east of the Galapagos Islands. 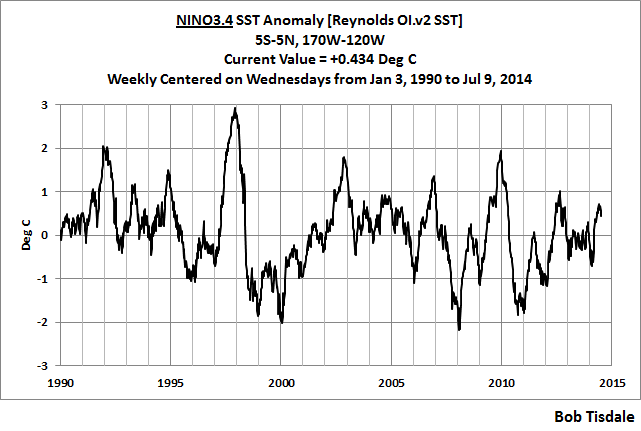 It had been showing the warmest sea surface temperature anomalies in response to that Kelvin wave. While not as low as the NINO3.4 values, the sea surface temperature anomalies of the NINO1+2 region are also falling, and falling quite rapidly. See Figure 2. Sea surface temperature anomaly data illustrated in the above graphs are available from the NOAA NOMADS website. The Southern Oscillation Index (SOI) is a product of Australia’s Bureau of Meteorology. The SOI is another commonly used metric for the strength, duration and timing of El Niño and La Niña events. It captures a portion of the atmospheric components of the El Niño-Southern Oscillation processes. We discussed the Southern Oscillation Index in more detail in Part 8 of this series. The Southern Oscillation Index is calculated from the sea level pressures of Tahiti and Darwin, Australia. El Niño events are strong negative values and La Niñas are strong positive values, which is the reverse of what we see with sea surface temperatures. El Niño conditions, according to the BOM, are a SOI value equal to or lower than -8.0 and a SOI value equal to or greater negative number than +8.0 indicates La Niña conditions. Because surface winds are associated with sea level pressures, a drop in the Southern Oscillation Index reflects a weakening of the trade winds in the tropical South Pacific and an increase in the SOI reflects a strengthening of the trade winds there. To reinforce (provide positive feedback to) the evolution of an El Niño, the trade winds have to weaken. After April, this has not happened so far in 2014. According to the BOM’s Recent (preliminary) Southern Oscillation Index (SOI) values, however, the 30-day running average of the SOI is at the -8.0 threshold of El Niño conditions. Because El Niño events take place along the equatorial Pacific, and because the Southern Oscillation Index is based on the sea level pressures off the equator (which can be effected by weather noise unrelated to El Niño processes), it’s difficult to tell whether this an indication that the equatorial trade winds are finally going to provide the necessary positive feedback and allow the El Niño to develop. So we have to look somewhere else. In their weekly ENSO update, NOAA includes a Hovmoller diagram of low level wind anomalies along the equator (5S-5N) for the eastern Indian Ocean and the Pacific Ocean. (See their page 16.) I’ve added some notes to it in my Figure 3. Don’t be intimidated by the Hovmoller. The vertical axis is time, with January 2014 at the top and July 2014 at the bottom. The horizontal axis are longitudes, starting on the left at 60E, which is in the western Indian Ocean, and ending on the right at 80E 80W, which is at the coast of South America. For the sake of discussion, I’ve added a fine highlight at 120E to separate the eastern equatorial Indian Ocean from the western equatorial Pacific. The color-coding is such that westerly wind anomalies are in shades of red and easterly wind anomalies are in blues. The latitudes for the wind anomaly data are 5S-5N, so they capture the equatorial Pacific, which is where El Niño processes take place. And the units are trade wind anomalies (not absolutes) and the trade winds normally blow from east to west. NOAA has provided three arrows to point out the westerly wind (anomaly) bursts, which indicate severe weakening and possible reversals of the normal east to west trade winds along the western equatorial Pacific. In the last week, weak low-level easterly wind anomalies have been evident across most of the Pacific. “Weak low-level easterly wind anomalies” indicate the trade winds are slightly stronger than normal…not weaker than normal. And that indicates that the equatorial trade winds are not providing the feedbacks necessary to help evolve the El Niño. Note also that there have not been any additional westerly wind bursts since early April 2014, contradicting all of the proclamations from around the blogosphere that there have been additional wind bursts. Unless there are additional westerly wind bursts and/or unless the trade winds weaken, it looks like this El Niño is going to disappear before it really got started. Thanks, Bob. Yes, it would seem like this El Niño might not happen or be very weak. Global temperatures are going nowhere, hurricanes are not forming in the early season. Thanks Bob, especially the hovmoller explanation. This is proving to be a fascinating puzzle. Do you think the wind blew that warm water West? Or do you think that area of ocean is simply running out of gas? Hi Pamela Gray: Some of it I’m sure was simply carried west and some poleward by ocean-atmosphere processes after it reached the surface. Much of it evaporated when it reached the surface. And in the following animation of subsurface temperature anomalies to depths of 300 meters, we can see some of it shifting off the equator (early June) and being carried west toward Indonesia. I suspect that occurred when the minor upwelling (cool) Kelvin wave came through (so small it doesn’t show up as a negative anomaly) and caused a portion of the warm water just east of the dateline to split off of the equator and then get caught in the south equatorial current. Another collapsed El Niño would be a big Q on present global weather pattern. If it does, it will be the second consecutive failed El Niño in weather history, doesn’t ti? 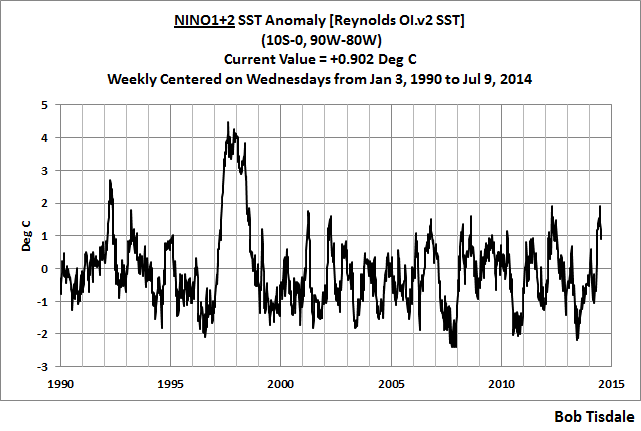 G. Y. Evan, 1993 also had El Nino conditions early in the year and then failed to remain there for the normal ENSO season. The sea surface temperature record for the equatorial Pacific is poor before the satellite era so our knowledge of early start/failed El Ninos is somewhat limited. FYI, the Aussies say: El Ni NO! Eric Webb, I can see what you’re noticing, but right now it doesn’t look very strong. I’ll also add that I have observed what appears to be approximately a 17 yr oscillation or so of increasing La Nina intensity via MEI throughout each cycle of this oscillation that tends into end in multi yr warm ENSO events although the 1920s & 1930s don’t seem to exhibit this signature, it is quite evident, especially in the post 1950 period…. Certainly if one looked @ the MEI record going back to 1871-2006 using this 17 yr oscillation of successively increasing la nina intensity, one would predict the la nines in the late 2000s would become @ the very least the strongest we’ve observed since the 1988-89 La Nina, which is exactly what happened with the 2007-09 & 2010-12 La Ninas, with the latter being the stronger of the two. I guess only time will tell what happens. The TPQDO, Eric? That’s about as obscure as an acronym gets. I assume you’re referring to the Tropical Pacific Quasi-Decadal Oscillation and the work by Misios. I hope you understand that it’s a study of response of a climate model. Actually, it’s not a lame excuse. Climate models differ greatly from reality. 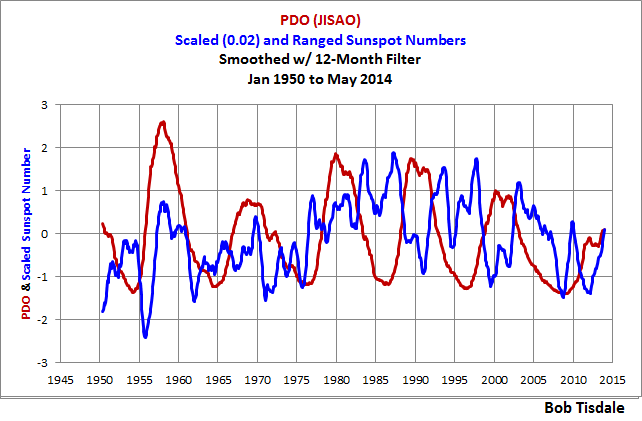 The PDO is an aftereffect of ENSO. 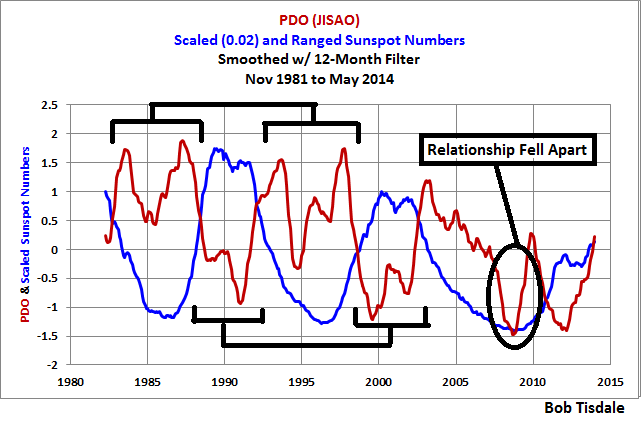 Using the PDO in a discussion of ENSO is a meaningless way to verify your claims about ENSO. Also, the PDO data do not appear to support your claim. Really? Data contradict you, Eric. The 1982/83 El Niño, the 1991/92 El Niño, and the 2002/03 El Niño occurred immediately after the peaks of their respective solar maximums, not minimums. 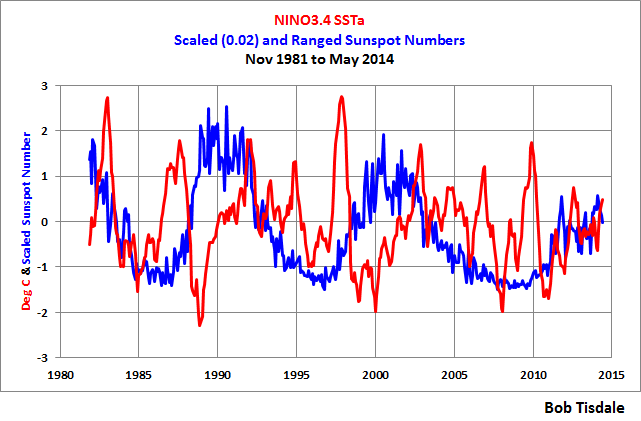 The 1994/95 El Niño, the 2004/05 El Niño and the 2006/07 El Niño occurred before the solar minimum. That’s 6 out of 9 El Niño events over the past 30+ years that contradict your claim, Eric. Sorry to say, Eric, I don’t have time to do your research for you. While I enjoy your enthusiasm, you need to study the subject matter before making claims that aren’t supported by data. It doesn’t only peak after solar maximums. 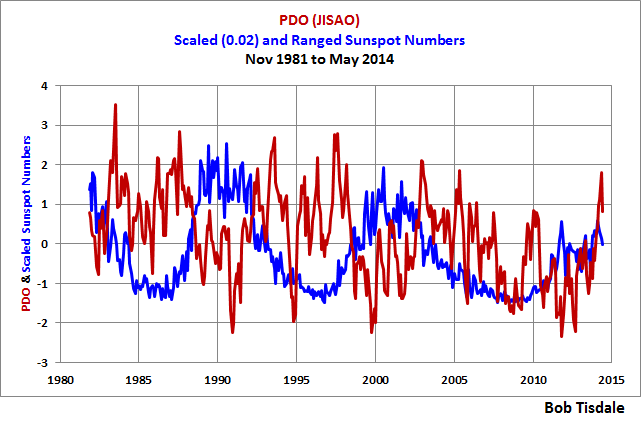 The PDO spiked BEFORE AND AFTER solar maximum. That’s why I presented the graph. Here’s, the data smoothed w/ 12-month filters. It’s not that you’re missing something, you HAD missed something. Additionally, now you’ve to conveniently changed your claim once the data have been presented. Also, if you hadn’t noticed, the relationship collapses in 2008. Next, in my earlier reply, I noted that the PDO index was worthless in a discussion of ENSO because the PDO index is not an ENSO index. Yet, you insisted in your latest comment on making erroneous speculative claims about the solar cycle and the PDO…claims that were easy to verify if you had only bothered to plot the data yourself. And in my earlier reply, I also advised you that I did not have the time to do your research for you, yet you insisted on speculating. I continue not to have the time to create graphs that clearly contradict your speculations, so consider yourself banned from this blog temporarily. For years, others have been making the same old tired claims you’re making and we’ve already seen that those claims are not supported by data. Thanks for asking, Gary. Yes. I’ve seen it. It’s a great tool for watching weather-related variation in a couple of variables. Bob, I think you may have misinterpreted the Low-level (850-hPa) Zonal (east-west) Wind Anomalies (m s-1) diagram. I think blue signifies a weakening of the Easterlies not a strengthening. I deduce this from the legend on the right hand side of the hovmoller diagram. This means that two weeks ago things looked a bit better not worse and this week they look a bit less better. But we have not seen the substantial weakening of the Easterlies needed to get a robust El Nino. It is getting late but there is still time. Thanks for organizing this wonderful thread. I started writing this post from the position of defending my prior post but as I am writing it I am not sure. Yes for sure blue means an Easterly wind anomaly. But the color coding for the red is positive numbers and the color coding for the blue is negative numbers. So it looks to me like there is really just one parameter here which is west to east wind speed. So it looks to me that red means stronger west to east winds and blue means weaker west to east winds which is the same as saying stronger east to west winds as the variable is the anomaly not the absolute value. .
Ok Have I just shown that you are correct? Is that your argument? These double negatives can drive you crazy. It would be a lot better if they defined anomaly better. By having two statements on the graphic defining westerly and easterly anomalies separately I think that adds confusion to the graphic. I think it is really a scale that relates to westerly winds. Not sure why they made that choice other than that is what you are looking for when looking for an El Nino. . I tried to correlate the graphic with the comments in the July 17 seasonal forecast where they discuss the state of tropical winds. I might attempt that again. I want to really get this straight. So perhaps someone needs to call the issuer of that graphic to get clarification as it is very important. Also if some others chimed in that would be helpful. . I write a column on climate and weather and discussed some of your work this week. http://econintersect.com/b2evolution/blog1.php/2014/07/22/july-21-weather-and-climate-forecast-1 I hope you do not mind that I used some of your graphics. My main interest is the economic impact of climate but this week I discussed (something I do not usually do) some of the issues related to the IPCC view of the world and began to describe your theory of the role of El Nino. If you think I have it wrong let met know. You can do that by private communication or just post your comments. I do not embarrass easily so if you point out flaws in my arguments I will appreciate that and not be annoyed. At the last minute I changed what I had planned to say about the easterlies because I was not sure your interpretation of the anomaly was correct. So I really would like to get that straight. Thanks again for operating this blog. I think it is a major contribution to peoples understanding of ENSO and other things as well. Hi Sig Silber: Sorry I did not expand on my previous reply. The “normal” direction for trade winds along the equatorial Pacific is east to west. Although this seems counterintuitive, “positive” trade wind anomalies (reds) represent a weakening of the trade winds (more toward westerlies) and possibly a reversal of the trade winds to westerlies. “Negative” trade wind anomalies (blues) represent a strengthening of the easterly trade winds. I think (don’t know for sure) NOAA selected that color coding and their way of presenting it so that red (warm color) anomalies would be associated with El Nino events and blue (cool color) anomalies with La Nina events. Thanks. I had it right initially then panicked that I had it confused but I am now believe I had it correct all the time. I do believe however that the explanation on the NOAA diagram adds to the confusion by having the two-line explanation when it is simply one thing…a change in the Westerlies the way they have it set up Red is an increasing from the normal condition and blue is a decrease from the normal condition. And for sure I know the Trades are normally Easterly in the Eastern Pacific and they should be relaxing if this is to be an Eastern Pacific El Nino and not another El Nino Modoki. . But the way that NOAA graphic is set up, the normal condition may be + or -. i.e. from the West or from the East. So the normal condition may be a westerly in the Western Pacific and Easterly in the Eastern Pacific but the color coding applies no matter what the normal wind direction and strength is as the color coding is the anomaly and as set up by the graphic artist is an “increase in the westerlyness of the wind”. So red always means more westerly and blue always means less westerly. .But it is simply arithmetic so less westerly means more easterly. I will look for your monthly reports. I was not consciously aware of them before but I may have come across them. I will look for them now. Thanks again for the clarification. I appreciate it. Sig, I assume we’re discussing the Hovmoller in Figure 3 of this post. Could part of the confusion between us be we’re looking at “easterlies” and “westerlies” as different directions? Easterly winds travel out of the east–from east to west, while westerlies are out of the west–from west to east. Nope. Normal is “trade wind” or easterly, which is east to west. Nope. Red can also mean weaker easterly (east to west) trade winds. Sig Silber says” So red always means more westerly”. I think that is a correct statement. Since if the norm is Easterly, coloring it red would mean more westerly which equates to less Easterly. What does “east-west” mean? Perhaps there is something wrong with me but I do not know what “east – west” means. If I had to guess I would have guessed it means Easterly Winds but then coding a westerly wind burst red does not agree with that interpretation. So I conclude that this Graphic reflects anomalies where red means more westerly (or equivalently less easterly) and blue means more easterly or equivalently (less westerly). That is why I say the anomalies is to be added to how westerly a wind is which means that if a wind is easterly you have to subtract the anomaly which is exactly what you have done correctly in your interpretation. The scale on the right is not clear as to what it is (there is no legend associated with that scale), and the two lines describing how to interpret that scale add confusion. The two lines imply that westerlies are treated differently than easterlies when in fact the color scale treats all winds the same way as it simply indicates the magnitude of the anomaly and that anomaly could apply to a westerly wind or an easterly wind. This then leaves it to the viewer to figure out what that means. I hope I am not confusing the issue or appearing to be argumentative as neither is my intent and at this point I clearly agree with your interpretation but am simply commenting on why that graphic issued by NOAA is difficult to understand. As an aside, my article today resulted in someone posting this on a web serve where my article was posted. So that is kind of like homework for me and most of it is familiar to you and things you have previously commented on. Sig Silber, “zonal” winds are east to west and west to east, as opposed to “meridional” that are north to south and south to north. I get that.. I know what “zonal” means. But you have the word “and” in there (and you could have said “or” and that is where the confusion springs. It is not clear the wind direction to which the anomaly shown color coded should be applied. The graphic does not say. I am a mathematician so I know what I am talking about. If “b” is the anomaly that is color coded, then a + b is different than -a + b. So you need to know the sign of “a”. And “a” is not provided on that diagram and we are left to speculate whether it is + “or” -. Indeed it is Westerly. That is why red which for different shades is shown as a positive number on the color code means “more westerly”. That is the clue that the not-shown wind speeds are Westerlies. I bet you that your raw data shows negative numbers for the Easterlies on the Eastern Pacific or at least they would be or could be coded that way in the computer. They have a different sign than the Westerlies and this can done with a scalar and a wind direction (two pieces of information) or by just one number similar to the way Kelvin is shown. When you translate Kelvin into Centigrade you need to add a sign. That is inconvenient for doing calculations so Kelvin works better. I think they have used a similar system here for wind speed. . I am not sure why you are disagreeing with me when we have no disagreement. It is clear from your discussion in Post 13, your current post, that you had to explain that a “weak easterly anomaly” noted on the Hovmoller diagram really meant that the Easterlies had strengthened. If the explanation on the graphic was better, you would not have needed to explain it. It would have been obvious to the viewer/reader. I don’t wish to beat a dead horse so I will not be posting again on this issue since I am clear and you are clear so the only disagreement is over how to describe why there was a need for you to explain that which was not properly (clearly/adequately) described on the NOAA Hovmoller diagram. I am far more interested in reading what you have to say about ENSO and other related matters and what others post than arguing over how NOAA could have made their diagram easier to interpret with respect to anomalies. Sig, sorry for the obvious confusion over wording. Me too. I initially was looking for clarification and received it and certainly did not wish to create additional confusion. I am looking forward to reading your Post #14. In the meantime I will just track the comments in #13.